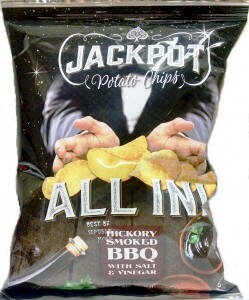 Jackpot Potato Chips are Hickory Smoked BBQ flavor with a crazy kick of Salt & Vinegar. These chips are sure to be a favorite among potato chip enthusiast's around the globe. Try some and you will be HOOKED on this combination flavored potato chip.